Three of the top six women's seeds and five of the top 13 lost today in the third round of the U.S. Open, decimating the bottom half of the draw. Falling in Flushing Meadows, N.Y., were No. 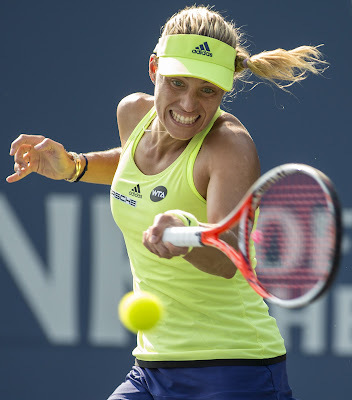 4 Angelique Kerber, No. 5 Petra Kvitova, No. 6 Caroline Garcia, No. 10 Jelena Ostapenko and No. 13 Kiki Bertens. With No. 2 Caroline Wozniacki and No. 11 Daria Kasatkina having lost in the second round, the highest remaining seed in the bottom half is No. 14 Madison Keys, last year's runner-up to Sloane Stephens and champion of the Bank of the West Classic at Stanford. Only three top-10 seeds are left: No. 3 Stephens, No. 7 Elina Svitolina and No. 8 Karolina Pliskova. Stephens grew up in Fresno and still has relatives there. No. 17 Serena Williams, who's trying to equal Margaret Court's record of 24 Grand Slam singles titles, also remains alive in the top half of the draw. The men's No. 4 seed, Alexander Zverev, also lost today, but the other top six seeds -- No. 1 Rafael Nadal, No. 2 Roger Federer, No. 3 Juan Martin del Potro, No. 5 Kevin Anderson and No. 6 Novak Djokovic -- have survived. No. 7 Marin Cilic, the 2014 U.S. Open champion, overcame Alex de Minaur, 19, of Australia 4-6, 3-6, 6-3, 6-4, 7-5 in a three-hour, 59-minute battle punctuated by breathtaking rallies. The 6-foot-6 (1.98-meter), 196-pound (89-kilogram) Cilic, seven inches (17.8 centimeters) taller and 44 pounds (20 kilograms) heavier than de Minaur, converted his eighth match point at 2:23 a.m. Sunday (EDT). No. 29 seed Dominika Cibulkova ousted Kerber, who won Wimbledon this year and the U.S. Open two years ago, 3-6, 6-3, 6-3 in a matchup of former Bank of the West Classic champions. No. 26 Aryna Sabalenka stayed red-hot with a 7-5, 6-1 victory over Kvitova, a two-time Wimbledon champion. Sabalenka, coached by Northern California product Dmitry Tursunov, won the Connecticut Open last week and reached the Cincinnati semifinals the previous week. She will face No. 20 Naomi Osaka, who blitzed Aliaksandra Sasnovich 6-0, 6-0 in 50 minutes. No. 30 Carla Suarez Navarro edged Garcia 5-7, 6-4, 7-6 (4) to set up a match against No. 22 Mara Sharapova, who defeated Ostapenko 6-3, 6-2. Sharapova, 31, has won five Grand Slam singles titles, including a career Grand Slam, and Ostapenko, 21, has claimed one. Marketa Vondrousova, a 19-year-old Czech, surprised Bertens, who beat four top-seven players en route to the Cincinnati title, 7-6 (4), 2-6, 7-6 (1). In a men's all-German encounter, 34-year-old Philipp Kohlschreiber eliminated the 21-year-old Zverev, now being coached by Ivan Lendl, 6-7 (1), 6-4, 6-1, 6-3. Federer, seeking his first U.S. Open title since winning his fifth straight 10 years ago, dispatched No. 30 seed Nick Kyrgios 6-4, 6-1, 7-5. Federer will meet Australia's John Millman, who beat Mikhail Kukushkin of Kazakhstan 6-4, 4-6, 6-1, 6-3 to reach the fourth round of a major for the first time. Millman won the 2015 Aptos (Calif.) Challenger, and Kukushkin advanced to the 2014 Aptos final, losing to former top-10 player Marcos Baghdatis. No. 21 seed Kei Nishikori, the 2014 U.S. Open runner-up to Cilic, topped No. 13 Diego Schwartzman, a quarterfinalist at Flushing Meadows last year, 6-4, 6-4, 5-7, 6-1. --No. 3 seeds and reigning Wimbledon champions Mike Bryan (Stanford, 1997-98) and Jack Sock beat Mackenzie McDonald, a 23-year-old product of Piedmont in the San Francisco Bay Area, and Yoshihito Nishioka of Japan 6-1, 7-5. --No. 14 seeds Raquel Atawo of Sacramento and Anna-Lena Groenefeld of Germany defeated Victoria Azarenka of Belarus and Latisha Chan of Chinese Taipei 4-1, retired. Atawo and Groenefeld will face No. 2 seeds Timea Babos of Hungary and Kristina Mladenovic of France. Babos and Mladenovic won the Australian Open this year and reached the 2014 Wimbledon final.